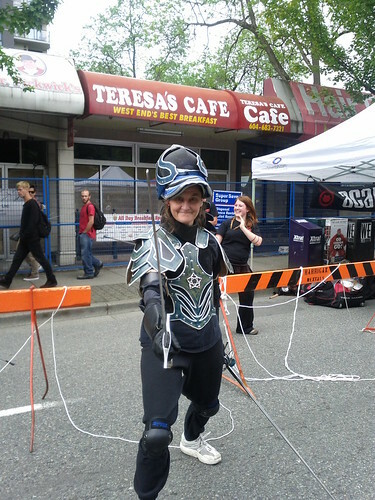 Today was Car Free Vancouver! 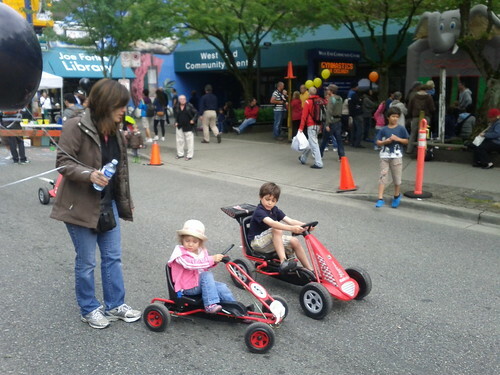 Gavin and I (and his dad) went to the big one on Main Street, which stretched from 12th Ave to 29th or 30th. It was a little quiet at first. I think it might’ve been a little too spread out; some stretches were pretty light on booths. But there was lots of stuff to see, and it was pretty fun. After that I went home… sorta. 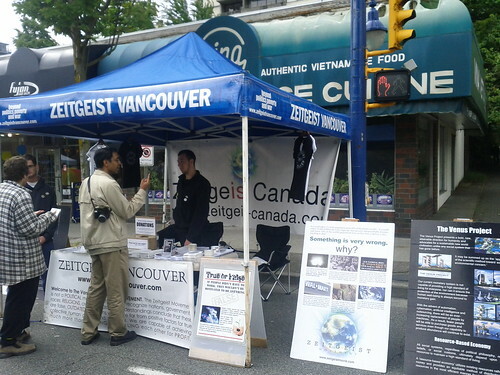 As a proud West Ender, I had no choice but to pop by Car Free Vancouver on Denman Street. It was considerably smaller than the Main Street version, but considerably funkier. 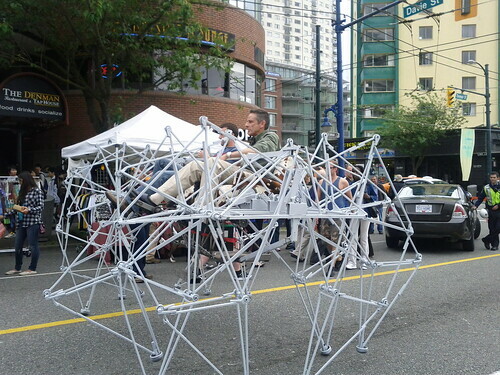 This mechanized spider was powered entirely by two sets of pedals. 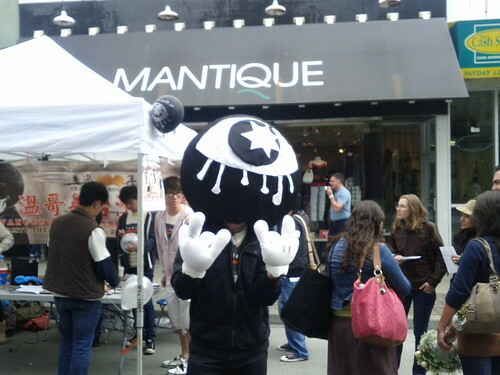 This eye monster represented some sort of Taiwanese film festival. There weren’t any cars, but there were still hooligans careening dangerously on the road. There were some bands, but not nearly as many as on Main. The Zeitgeist people were there, as usual. 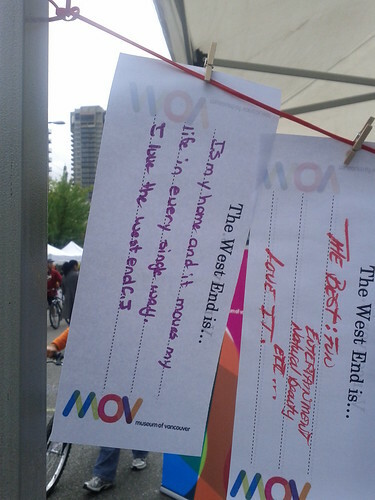 The Museum of Vancouver had a table where people were invited to write their opinions of the West End and Vancouver on flyers. I had a good talk with the woman working there. 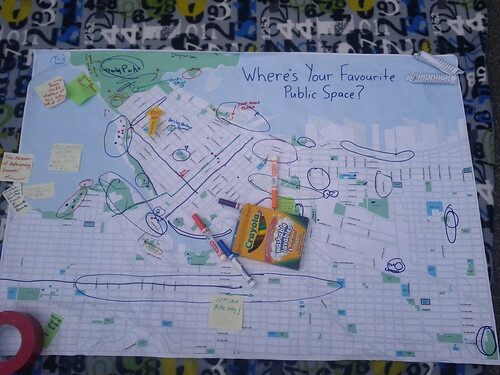 I believe this was part of a Vancouver Public Space Network display. 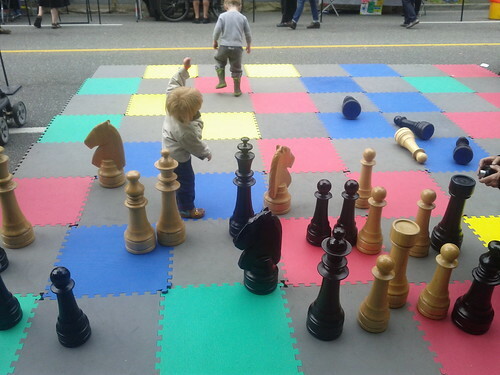 The novelty giant chess pieces were out again. 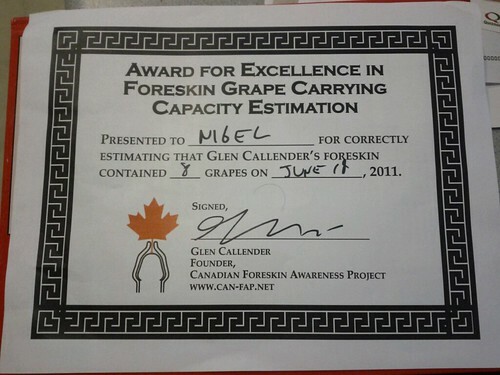 And a tent for the Canadian Foreskin Awareness Project. 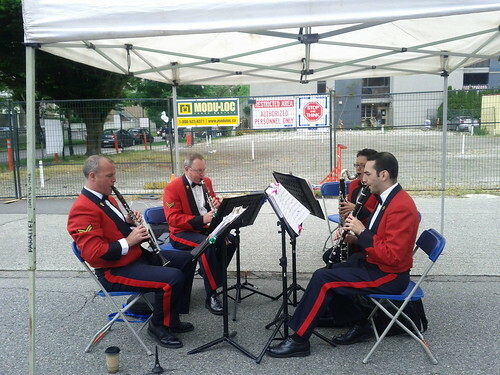 The West End Neighbours were there, of course (as was WERA and some seniors groups). 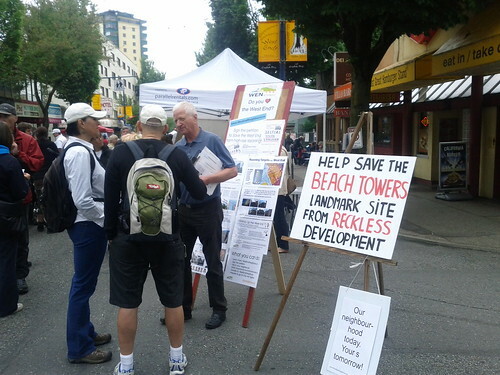 I find WEN to be incredibly NIMBY, even by Vancouver standards, but I support community organizing. I also got to talk to Adrienne Carr (and briefly Spencer Herbert, my MLA). It was pretty cool! Also, as for the rest of the weekend… on Friday some friends from work and I went to La Belle Patate on Davie Street for poutine, which was delicious. 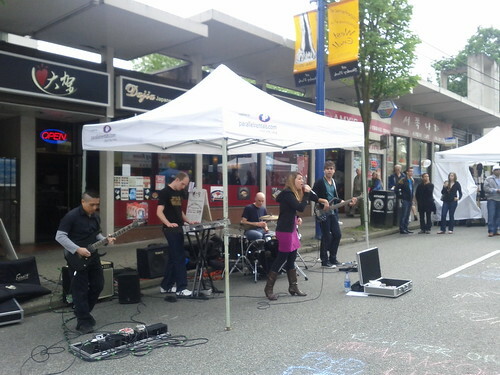 Saturday morning I had a dental appointment — not for long — and then hung out with some friends and played Rock Band, then went to The Eatery, and then finished the night at Celebrities on Davie Street to see a drag queen show. Alan: I wish I was in vancouver still so I could get one of those can-fap shirts. And a certificate. Glen Callender: Hey Alan, the shirts are available online… get em here!